So yeah, I finished Ulysses. It took about three and a half weeks, although of course I was doing (although not reading) other things during that time as well. As a snap judgement, I would describe it as not quite as difficult as I had expected, but maybe not quite as amazing as I had hoped, either. I suspect to get the most out of it you might need to read it multiple times, but although a re-reading might be a jolly project for some unspecified future date I am not going to leap to put it on the late 2010 to-do list. For the uninitiated: Ulysses is 600 pages of small type by James Joyce. Written in the 1910s and published in 1920, it concerns the actions of a few middle-class Dubliners on an ostensibly normal day in 1904. It is structurally linked to the Odyssey, although literary scholar Mrs.5000 contends that "it would be easy to make too much of this" and I am firmly inclined to agree. Each of the 17-some chapters is also linked with its own color, organ of the body, and set of symbols. I followed along with these using a handy chart in the early chapters, but I ultimately found that this was completely distracting and rendered the book more artificial than artful. I therefore recommend ditching the chart. (There are, I believe, plenty of interpretive guides to Ulysses that you can keep at your side while you read. I didn’t use one, so I can’t say whether those are helpful). In addition to having its own set of symbols, each chapter is also written in its own stylistic medium. The most famous of these are probably the stream-of-conciousness chapters, one each for the major characters of Stephen, Leopold, and Molly. A few others are more or less straightforward narrative styles, but there is also odd stuff like a surrealist playscript and (my favorite) a catechism (an FAQ, we might style it today) thrown in there for good measure. 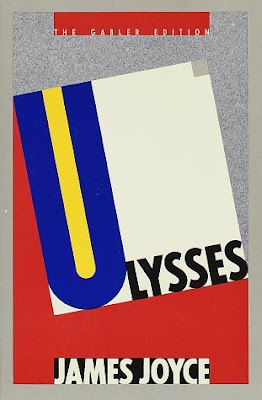 I am sure there is an argument to be made that this variety of stylistic approaches lends Ulysses an overall artistic unity, but for a newbie like myself the novel comes off as a sort of scrapbook of literary approaches built around a central theme. ...as MDIC asks, in response to my Facebook gloating over finishing the thing. Well, the commentary in my edition says it's all about "love." Much like the collected works of Mariah Carey then, I suppose. “Ulysses is all about love” is an not a difficult case to make, but it is also such an astoundingly banal thing to say that it’s a little hard to see how it got past the goalies at Random House. Maybe they assumed we’d be too exhausted to read the commentary, which was placed after rather than before the main text. 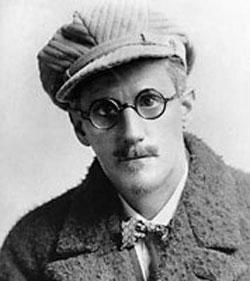 My guess is that Ulysses is largely "about" James Joyce experimenting with fictional form, which is cool. It was interesting to listen to genre fiction audiobooks while I was reading The Big U, and wondering how much of the fluid points-of-view, fractured experiences of time, and subjective rendering of reality that we accept easily today even in popular fiction might trace its roots to Joyce. I dunno, of course -- I ain't no literary historian. Just speculating. But there is a narrative thread of sorts, too, so I'll now declare the presence of spoilers while at the same time suggesting that this is the kind of book where knowing the plot -- the “plot,” really -- in advance won't hurt your enjoyment, and might even help. I'll say, too, that I'm not 100% sure that my description of the “plot” is ~accurate~, as it is not always entirely clear what's going on in Ulysses, and whether you can believe that what's going on in the characters' heads is an accurate take on the in-book reality. Anyway. As in the Odyssey, the first chunk of the book is about the secondary character. In this case, it’s Stephen Daedalus, a smart but naive recent graduate (think The Graduate, maybe) who is being taken advantage of by his insufferable but charismatic roommate, stately, plump Buck Mulligan. Stephen has an argument with Buck, then goes to his work at a boy's school, then, because it's a half-day, he gets off early and takes a walk down the beach. That's, like, the first 70 pages or so. Then we shift to Leopold Bloom, a smart, earnest, crankish, and fairly ineffectual guy who we will spend the bulk of the book with. He is well-meaning and essentially good-natured, and he has survived a great deal of grief -- the death of his son, the suicide of his father -- and still keeps his chin up. His wife and all his friends, however, all hold him in various degrees of contempt, which is kind of depressing. His home life is pretty dysfunctional, too. All in all, it's not an especially cheerful book. Over the course of the day Leopold makes breakfast, goes to a funeral, makes a token gesture towards his job as a newspaper advertising salesman, goes for lunch, has an afternoon drink, goes for a walk on the beach and ogles girls, hangs out with some medical students, and eventually runs into Stephen at a highly seedy establishment where that young man may or may not have been drugged by Buck Mulligan, who is always looking to bum money off of him. Bloom sobers Stephen up and takes him home, where they have a late night conversation before taking a leak together in the back yard (one of the best scenes in the book, I thought), and parting. Then he goes to bed, and the final chapter is his wife Molly's drowsy thoughts about him and how he fits into her life and her richer-than-average love life. Oh, sure, Ulysses was banned for being sexually explicit and all that, which is probably the best thing that ever happened to James Joyce’s legacy. Having a big scandal erupt about the sexual content of your book isn’t generally going to hurt sales, and if your literary fans get to position themselves as Defenders of Intellectual Freedom, that’s not a bad bonus either. It’s certainly true that the book is very sexually explicit, and covers what must have seemed at the time a shockingly broad array of sexual topics. But it's not the least bit titillating, which is why its obscenity case was eventually thrown out of court, allowing it to be sold to the curious and, you would have to think, probably often quite disappointed general public. So That’s It? Three People Having an Ordinary Day? Well, I’m guessing that Ulysses is probably also "about" trying to craft a novel that represents the lived experience of relatively normal people rather than artificially plot-driven narratives about extraordinary people, or about simplified, stripped-down representations of people. I would imagine that this was a democratic impulse on the part of Joyce, an attempt to do to or with literature the same kinds of things that social historians tried to do in order to cure classical history of its exclusive focus on the decision-making of powerful men. This democratic ideal did not, however, yield a novel that is particularly accessible to the dude on the street. Now, I've read that the descendant who currently controls the Joyce estate thinks that Ulysses can and should be enjoyed just like any other novel, and likes to blast the academic industry surrounding the novel as having obscured its simple message and made it more difficult to connect with. This is just so much sillybuggers. As a well-educated and passably well-read native speaker of English, it took a great deal of effort for me on this, my third attempt, to merely make it through the book. The text has plenty of rewards, but you must work for them and work for them pretty hard. There is much that would have been utterly opaque to me if I wasn't fairly well-versed in Shakespeare and knew the rough outline of Irish history, literary movements of the early 20th Century, classical literature, and the nature of everyday life in Europe in the early 1900s. And I am aware that I missed much, much more by not having a mastery of these subjects, plus a working knowledge of Irish popular culture 1870-1904, a command of Greek, Latin, and Italian, and a firm grip on the Irish political scene of the day. It's a tough book, no two ways about it, and for readers with a steady diet of mainstream popular fiction I would suggest working up to Ulysses through an increasingly challenging series of other classic novels. I'm glad I read the Odyssey first; Hamlet would be another must-preread if you don't already have it under your belt. Yay! I Read the Entire Review of Ulysses! Not so fast, Gentle Reader. I’m also hoping to do a chapter-by-chapter breakdown. Stay tuned. You've possibly revealed something about a book I tried to read once, but stopped because I hated it for being rambling and sexually violent. It's called The Big U and it's by Neal Stephenson, who wrote Snow Crash, a much better book. I'm now interested in whether The Big U was inspired by Ulysses, or if it's a rambling in a completely different and unrelated way. Wondering, did you read the edition that you pictured (Gabler, 1986 - sometimes called the "corrected edition") or another? Avia: Stephenson is hit and miss. I liked Snow Crash too, a lot, and then hated several in a row. I tried again with Anathem earlier this year, and kinda liked it. Phin: I did read the Gabler. Word on the street is that a lot of the corrections have since been called into question, and the cool kidz mostly have fallen back on an earlier edition. I can't imagine that such subtleties have TOO too much impact for someone reading it at my level, but you never know. I tried to read Ulysses a couple of times, once in high school, then in college, and then, finally, when I did my junior year abroad in Dublin (doing English and history), I finished it, partly because I felt like I had to for my literature classes and partly because it was MUCH easier to understand after being in Dublin a few months. First, getting acclimatized to the cadence of Irish speech and Irish vocabulary really helped. Irish English is really a very different language and it is very much a spoken language. I don't know if the Irish of 1995 was exactly the Irish of 1904, but it sure was closer than the American of 1995. Also, merely understanding place names helped. Bloom does a lot of walking. It's like trying to read a book about New York without understanding the different feelings of Manhattan, Brooklyn, and Queens. And you can still go to the same bar that Bloom goes to and order a white wine with gorgonzola. Also, one of my lecturers at University College Dublin was Declan Kiberd, who wrote the preface to the Penguin edition, so got some fairly insightful guidance while I was reading it. Which helped immensely. (Classes were 400 students, so my namechecking does not imply some deep personal relationship with a godlike Joyce scholar). The one "guide" I did learn about there that I would recommend it Stuart Gilbert's "Ulysses". It was written by an American painter whom Joyce happened to drink with in the 10's-20's while writing Ulysses and the consensus is that Joyce was the brains behind the book and intended to be a sort of authorized roadmap. Well, hats off to you. I've heard this is one of the hardest books to read. Lots of smart people have abandoned it. I don't think I'm ready for something like this.